Summer vacation season is here, and many people will soon be heading off to a favorite location to relax. The sad truth is that an accident can happen at any time, without warning, maybe even more so while you’re on vacation, since people tend to let their guard down. 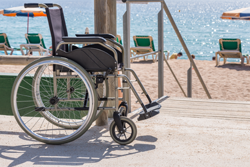 The White Plains accident attorneys at Worby Groner Edelman have experience in all phases of personal injury law, and can help you if you’ve had an accident while on vacation, or at any other time. Check out your surroundings when you’re away from home. Be familiar with the nearest fire exit if you’re in a hotel. Be careful about opening your hotel room door to anyone – use the viewer in the door to see who’s there. Many hotels have great recreational facilities, but be aware that at least in some states – New York included – you use those facilities at your own risk of injury. Under a doctrine called “Assumption of Risk”, the owner of a recreational facility is not liable for injuries sustained while using those facilities. One good way to avoid injury while participating in a recreational activity is to use simple common sense. Don’t run in a pool area. Be aware of the condition of a tennis court or golf course before you start to play. Never enter a pool head first unless you’re absolutely sure that the water is of sufficient depth. Don’t swim in the ocean without a lifeguard, and never by yourself. If you’re a hiker, don’t hike alone, especially on unfamiliar trails. Perform a safety check before you use any rented equipment such as a jet ski, or motor boat, and do what you can to satisfy yourself that the equipment is safe. Some people vacation through participation in what is today called the “sharing economy”, meaning that your lodging may not be in a traditional hotel, but rather in someone else’s home, or you may be using someone else’s vehicle for transport. Spending a few minutes upon arrival to check out the safety condition of the premises where you are staying can make all the difference. There should be smoke detectors in all sleeping areas, and fire extinguishers at known locations throughout the house. If you have young children, make sure that the electrical outlets are covered to prevent electrical injury. Make sure that the doors lock properly in order to avoid theft of your possessions. Contact the White Plains accident attorneys at Worby Groner Edelman LLP for a free, no obligation consultationif you are involved in an accident while on vacation, at home, or at any other location. Our accident attorneys will answer your questions, help you process your medical bills, and sort out the insurance coverage. We will handle your case, and move it to resolution in a prompt manner. While we will attempt to settle your case for the right dollar amount, we will simultaneously prepare your case for trial so that if the insurance company will not settle the case for a fair figure, we will be prepared to try your case. The lawyers at Worby Groner Edelman LLP have years of experience, and will aggressively represent you in court if a trial is necessary. There is never a fee unless we are successful.